With its literal invitation to ‘see, hear and evolve’, Sensorium in its inaugural edition is looking at photography at its intersection with literature, cinema and music. The genesis of the festival, explains Creative Director, Prashant Panjiar, lies in the integration of arts, literature and ideas. “The idea is to look at the arts, be it cinema music, photography, theatre, literature and integrate them with an idea,” he avers. The thought also stems from the fact that with photography being so rampantly practised these days, the value of the physical image has diminished. “For art to flourish these days people must experience it and that cannot happen in a single dimension of space. Through the integration of ideas, the photograph transcends being a mere image. It excites and evokes a new feeling from within,” emphasises Panjiar, co-founder of the Delhi Photo Festival and Nazar Foundation, who has served as photojournalist and editor in some of India’s most reputed newspapers. Now as he continues as a consulting picture editor and mentors younger photographers, he directs them to think ‘out-of-the- box’. Sooni Taraporevala’s journey from the idea to the visual in ‘Salaam Bombay’. The festival has also invited author and poet Jeet Tahyil, writer William Dalrymple, Director Ritesh Batra and Artist Jitish Kallat among others to share their ideas and experiences. 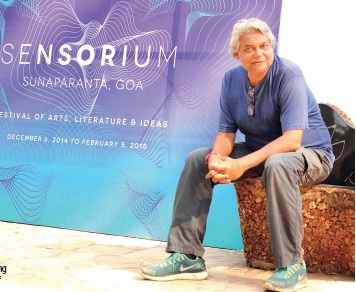 The seed of the idea has only just commenced with Sensorium; one which Panjiar promises will evolve with time. From Screenplay to Screen Salaam Bombay! Jesús Clavero-Rodríguez (curator) | photographs by Subrata Biswas, Adil Hasan and Sudeep Sen | poems by Octavio Paz, written when he was ambassador of México in india (1962-68).